Over the weekend, I visited one of my favorite record stores where I found a funny album cover that I decided I must own. 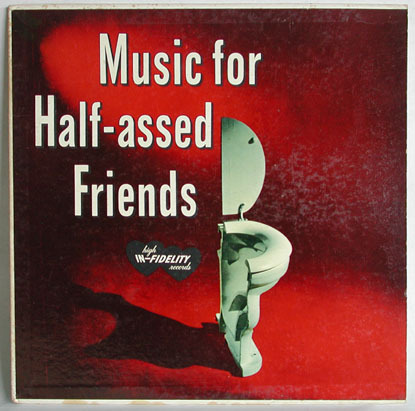 Apparently, “Music for Half-Assed Friends” was an album cover released without any actual vinyl platter inside. It was merely an empty album cover, sold to collectors that wanted to impress their friends with goofy album covers. I have no idea when this product was actually sold, but I’m guessing it was either during the 50s or 60s, back when MAD magazine was running strong. Hmm… I’m wondering if the next-to-last song title might have been inspired by a certain garage rock anthem? Ha, I just found my copy at a garage sale. Inside is a cardboard cut-out of an album that says, “I bought this Album for you as a gift…sorry, I couldn’t afford the record!” below that is a place to sign your name. Date on back says 1962.
copies of them and do you think I should go back on the market with them. Fantastic stuff, Bob! LOVE IT! As a child my parents has a copy of MFHAF. as a young child I marveled at it and wondered if we could ever get to hear the vinyl. It always sounded fun and we wanted to know more. Parents were a little reluctant or unable to explain. I am glad to hear a little more of the story. It was also a curiosity because of the similarity the last name. My uncle is Bob Booher. The might work to market them again! Cheers. I have the Music For Casual Affairs cover, but would like to know what the other 10 titles were. I saw this when I was a Tween in the late 1960’s. I wish I knew the exact location in Manhattan, NYC, I would’ve gone back a few years later and looked it up.